The way we treat each other is a topic that often finds its way into our private conversations and is regularly in the news. For example, Starbucks has been in several headlines recently because it’s staff called the police on two black men for sitting in a Philadelphia branch without ordering anything. The men were arrested for trespassing. Starbucks response was to shut 8000 stores and roll out a day’s implicit or unconscious bias training for employees. This approach generated mixed views about the effectiveness of a day’s training. Organisations are constantly challenged to create environments which make employees and service users feel included and valued, and they turn to diversity programmes to help everyone understand their own biases, increase employee/customer engagement and satisfaction, and create an environment that fosters diversity and inclusion (D&I). 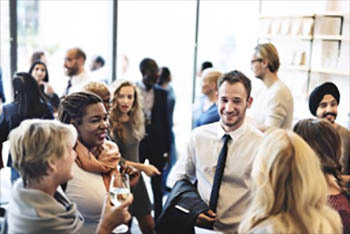 Generally, when an organisation talks about diversity training, it is an umbrella term for key corporate messages, equality legislation, unconscious bias, and strategies for increasing inclusion. Whilst such programmes have existed for a long time, an internet search will reveal a plethora of views as to the effectiveness of such. 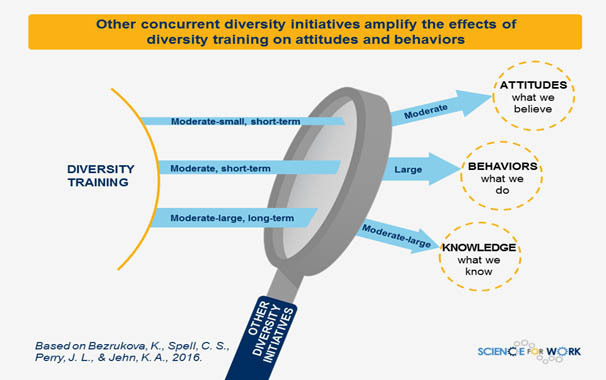 In 2016, Katerina Bezrukova, Chester Spell, and Jamie Perry – from the USA, and Karen Jehn – from Australia, investigated whether diversity training works and, if so when it works best. They selected 260 of the most rigorous studies so they could provide a more evidence based and trustworthy answer than the popular press was offering. The study showed that three things define our interactions with others who are different from us: our knowledge, our attitudes, and our actions. Diversity and Inclusion (D&I) training has a positive effect on all three elements albeit to different extents. For example, immediately after the training, people show they can change their beliefs and behaviours to some degree. Also, as time passes, people demonstrate that they can remember the new knowledge, however, their beliefs and behaviours tend to revert to how they were before the training. This raises the question as to why this is the case. The answer might be because it is harder to change beliefs as they are strongly linked to our emotions and our self-identity. When does diversity training work best? The study showed that the length of diversity training programme influenced its overall effectiveness. This is because longer training courses enable participants to have more opportunities to interact with others who are different and develop confidence and a sense of comfort whilst doing so. Greater comfort levels are often the precursor to greater sharing of different experiences, as well as being supportive of challenges to beliefs and thought patterns in a safe space. A longer training period also means everyone has more time to reflect, think and practice as part of a blended learning approach. Any change in behaviour will more likely last if it is actively sustained through other diversity-related initiatives alongside the training. All too often a ‘sheep dip’ approach is adopted where everyone gets a day’s training. The principles shared, the learning undertaken and commitments made to change behaviours are never formally revisited. Employees need to see that management is truly committed to fostering inclusion, and that the training is not just a tick box exercise to meet a legal requirement. A broad approach to diversity and inclusion which demonstrates management commitment and policy alignment with practice can be a powerful motivator for participants to engage, be open to learning and reflect on their own behaviour, thoughts and bias, and have the confidence to apply what they have learnt on return to work. D&I related conversations in teams, appraisals and reviews will also help participants integrate key messages of training into daily behaviours and tasks. The focus of the D&I training and the approach to programme design are also important: the most effective training courses focus on developing both awareness and skills. Firstly, participants become more aware of their own and others’ cultural values and biases and then they monitor their actions and practice appropriate responses in interactions with diverse groups of people. The design approach adopted by the D&I trainer is an aspect that is rarely considered fully, though the impact of this oversight can be far reaching. Programme designers are sometimes so mindful of the sensitivity and potential emotional impact (and sometimes their own discomfort with the subject plays a part), they make the programme very generic and factual (in terms of legislative drivers) to avoid potentially treading on people’s toes. This approach deprives participants of the opportunity to raise levels of self-awareness, take ownership of or share their beliefs, attitudes or experiences. Creating a safe space to do this is crucial and requires a highly skilled facilitator rather than a staff member being charged with going through the ‘do’s and don’ts’ of equality, or an online course being developed. As for training attendance, people tend not to like mandatory training, however, if it is well designed and tailored to respective groups (i.e. senior managers face different challenges to customer facing staff) participants may be more likely to change their behaviours following the training. Voluntary attendance works well because people like being able to choose for themselves. However, it is possible that voluntary training will attract people who are already interested in the topic, who already behave positively, and therefore have less to change in terms of the way they interact with people who are different from themselves. Over the last 30 years most D&I initiatives have concentrated on changing behaviours. Whilst this approach has been an important aspect of learning around difference, transformational change requires a deeper more fundamental connection with an understanding of our unconscious motivations which can shift attitudes and beliefs. This is notoriously difficult but without it, any change runs the danger of being superficial and is usually short lived. Our approach, therefore, seeks to engage participants in double loop learning in order to encourage deeper insights into how experiences, culture, bias and values, whether conscious or unconscious, drive thinking and behaviour. The nurturing of higher levels of consciousness will lead to decision making and working practices being better informed and less vulnerable to unwitting discrimination. Start other diversity initiatives. For example, Line Managers can review the diversity of their teams and encourage cross discipline working to facilitate contact between employees they might ordinarily not get to work with. Consider assigning Diversity and Inclusion responsibility: appoint specific people to define and track diversity-related metrics in different areas of the organisation, such as recruitment or development; reward and recognition use. This will enable you to see data compared to desired diversity-related objectives. Make sure training is long enough for participants to interact with each other and to discover things they have in common. It is counterproductive to decide the duration first and then squeeze in whatever fits without regard to what participants need to learn and the time they will need to apply said learning in practice sessions. During training, focus on both awareness and skills. Help participants realise how people differ from each other and the biases we all have. Ask people to monitor and reflect on their current ways of behaving, and practice more helpful alternatives. Diversity and Inclusion training CAN and DOES work as long as it is part of a larger strategy. With the right blend of reflection, open and honest dialogue, and learning activities it is possible for participants to begin the process of peeling off layers of bias they perhaps did not know they were accommodating. However, in addition to these efforts, there will need to be consideration and sometimes a review of formal organisational policies, procedures, and/or practices that are in place to ensure an inclusive environment. Working on creating an inclusive culture needs to be a year-round commitment made by people who fully understand the benefits of diversity in the workplace.